Charleroi (pop. 201,000, with suburbs 500,000) is an industrial city on the Sambre River, and the second largest city in Wallonia after Liege. Heart of the "Black Country" (thus named because of the coal mines), Charleroi is one of the poorest and least attractive cities in Belgium. Its unemployment rate hovered above 20% in 2016. The city has a bad reputation for its poor safety record and its corrupted Socialist politicians. On the bright side, Charleroi shares the title of capital of the Belgian comics with Brussels. 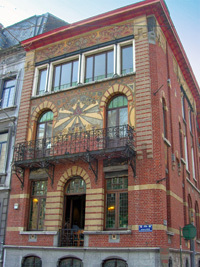 Dupuis Publishing is based in Charleroi. The Marcinelle School gave birth to famous characters like Spirou & Fantasio, Marsupilami, Boule & Bill, or Lucky Luke. Charleroi also has a handful of arts museum to offer to the visitor. The city's suburb of Gosselies is home to the Brussels South Charleroi Airport, the largest passenger airport in the Walloon Region. It is also considered as Brussels' second airport. Flights are mainly operated by discount airlines such as Ryanair and Wizzair. Charleroi is a new city by European standards. It was only founded in 1666 by the governor of the Spanish Netherlands, and named in honour to the 5-year old Charles II of Spain (1661-1700), the last ruler of the Spanish branch of the Habsburgs. Ominously, King Charles II suffered from physical and mental disabilities caused by generations of inbreeding within the Habsburg family. Shortly after its foundation, Charleroi was already besieged by foreign armies. First taken by the by the Dutch, it is ceded to the Spanish in 1678 (Treaty of Nijmegen), taken by the French in 1693, ceded again to the Spanish in 1698 (Treaty of Rijswijk), then taken by the French, the Dutch, the Austrians in 1714 (Treaty of Baden), the French again in 1745, only to be returned to the Austrians 3 years later. After the troubled times of the French Revolution, Belgium finally got its independence in 1830, paving the way for a new era for Charleroi. During the Industrial Revolution, Charleroi became a major centre for glass, metallurgy, and coal. The city walls are town down between 1867 and 1871, permitting to the city to expand. Charleroi then becomes the economic power house of Belgium, second richest city in the country after Brussels, and propels Belgium to the rank of second world power, just behind the United Kingdom. From the 1920's to the 1950's, several waves of Italian immigrants came to work in the coal mines of Charleroi, Mons or Liège. In 1955, 32% of all miners in Belgium were Italian. Nowadays, there are still 60,000 people of Italian descent in Charleroi alone (over a third of the city's population). The decline of the Industrial Revolution, emphasised by the discovery of petrol, cheaper than coal, slowly forced the collieries of Wallonia and Northern France to close one after the other. The waning of the heavy industries following WWII caused serious economic upheaval to the region. The economy has tried to diversify in the past decades, especially with the aerospace industry. The main companies present in Charleroi include Industeel (a subsidiary of Arcelor-Mittal), AGC Automotive (a subsidiary of Asahi Glass), Alstom, SABCA, and Sonaca. 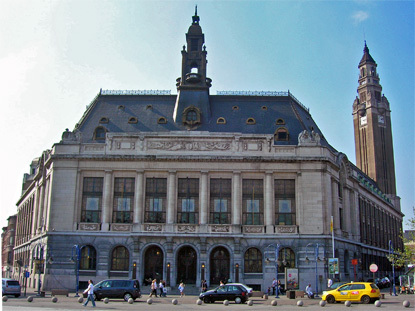 In 1976, the merger of the communes in Belgium makes of Charleroi the largest municipality in Wallonia (223,000 inhabitants, more than at present). The city has been a stronghold of the Socialist Party (P.S.) ever since. The party got over 50% of the votes at local elections between 1982 and 2000. It only lost considerable grounds at the 2006 election, after a long series of scandals involving Socialist politicians. 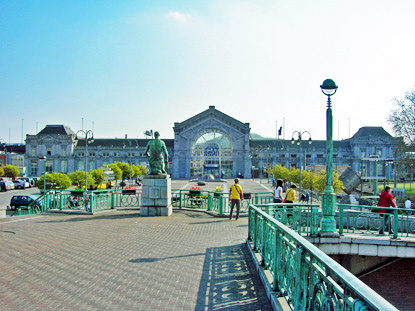 The main train station, Charleroi Sud, is at the bottom of the lower town, just south of the River Sambre. The ville basse is particularly dingy and run down. This is however where the three nicest places in the city centre are located : the train station itself, the neoclassical St Anthony Church, and the Passage de la Bourse ("stock exchange passage") next to it. 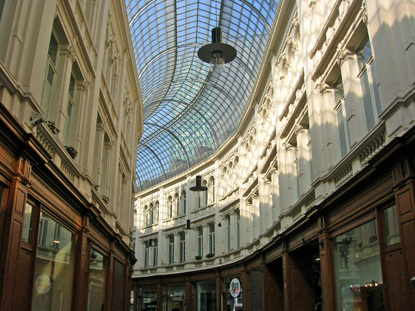 The Passage de la Bourse was one of the first shopping gallery in Belgium, and reminds of the Galeries St Hubert in Brussels. It now houses a few second-hand bookshops and a big interior decoration shop. The communist-looking Place Albert 1er separate the Lower Town from the upper section. The pedestrian Rue de la Montagne is main shopping street, and leads straight to Place Charles II in the upper town, where stand the town hall and the basilica. Central Charleroi can be divided in two parts : the Ville Basse (lower town) and the Ville Haute (upper town). The neoclassical Hôtel de Ville (town hall) was built in 1936 and houses the Fine Arts Museum (2nd floor). It is surmounted by a 70m-high Art Deco belfry made of brick and stone. Its carillon has 47 bells that rings every quarter of hour on the tune of a popular song by Jacques Bertrand. Charleroi's belfry is by far the newest in Belgium, but this did not deter the UNESCO from adding it to its World Heritage List along with its older neighbours. The Fine Arts Museum of Charleroi honours the painters who were born or lived in the region, notably big names like the surrealists René Magritte, Paul Delvaux, the expressionist Pierre Paulus, the impressionist James Ensor, the caricaturist Félicien Rops, or the realist Constantin Meunier. Opposite the town hall stands St. Christopher Basilica. 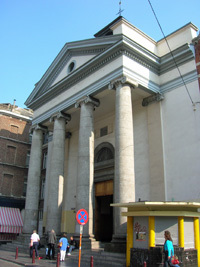 It was originally a small Baroque-style church, which was extended in 1957 and renovated in 1994. Most of the building is in concrete, topped by a copper cupola. Behind the town hall, on Place du Manège, the Palace of the Fine-Arts (erected in 1954) is a concrete eyesore from the aftermath of WWII. A bit further east of the basilica, at the angle of Rue Tumelaire and Boulevard de Fontaine, the Art Nouveau Maison Dorée (built in 1899), is one of the few houses worth stopping for in Charleroi, even if it is really not that exceptional. The 17th-century castle of Monceau-sur-Sambre (access from Place Albert 1er), a few kilometers west of central Charleroi (follow Mons Road), has a magnificent English-style park open to the public all year round. 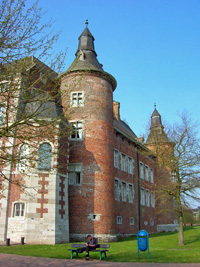 The imposing castle may in itself be the best reason to visit Charleroi, even if it cannot be visited. It is one of the finest example of Mosan-style architecture applied to a military construction. The Bois du Cazier in Marcinelle (2km due south of Charleroi's South Station) is a park fitted out on the site of an old coal mine, sadly famous for the 1956 catastrophe which killed 262 miners. There are three slag heaps with walking paths. The Espace 8 août 1956, the Industry Museum and the Glass Museum all commemorate the firedamp accident. 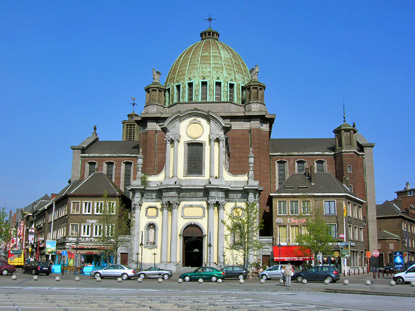 Charleroi is located on the E42 motorway, about halfway between Namur and Mons. Coming from Brussels, take the E19 towards Mons, then the A54 at Nivelles. 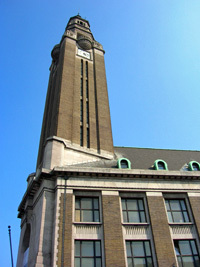 Charleroi is a main railway hub for the province of Hainaut. There are two stations in the city centre : Charleroi Sud (the largest) and Charleroi Ouest. The former has direct trains to/from Brussels (50min), Namur (30 to 40min) and Mons (30 to 40min), among others.